Visited by more than 1.25 million people each year and covering close to 800,000 acres, Joshua Tree National Park offers a wealth of outdoor recreation and adventure opportunities. 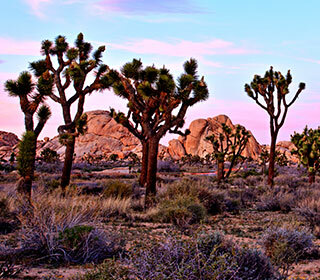 Hiking, camping, rock climbing, mountain biking, horseback riding, wildflower viewing and exploring the forests of rare and beautiful Joshua trees are just a few of the reasons why this park is one of California's most popular natural attractions. Joshua Tree National Park was first inhabited by Native Americans and later by explorers, cattle ranchers and miners who built dams and mined for gold, unfortunately plundering many of the park's natural resources. In 1936, a wealthy patron named Minerva Hamilton Hoyt persuaded President Franklin D. Roosevelt to designate Joshua Tree as a National Monument and in 1994, it became a National Park. At the Indio Super 8 we make it easy to enjoy your visit to Palm Springs and a tour of Joshua Tree National Park. Our affordable and pet-friendly hotel is located only 20 miles from the Cottonwood Visitor & Information Center at the southern entrance to the park. Spend your days at Joshua Tree and your nights relaxing at Indio's only elevator-accessible hotel, which also offers complimentary parking and breakfast, free WiFi, an outdoor pool, fitness room and more. Days can be spent touring the attractions in Joshua Tree National Park, but visitors with limited time shouldn't miss one of the 12 self-guided nature trails along the main road, three of which (Bajada, Cap Rock and the Oasis of Mara) are wheelchair accessible. Housing 501 archeological sites, 88 historic structures, 19 cultural sites and 123,000+ artifacts, Joshua Tree also includes 9 campgrounds, picnic areas and exhibits along the road and at the park's four Visitor Centers.